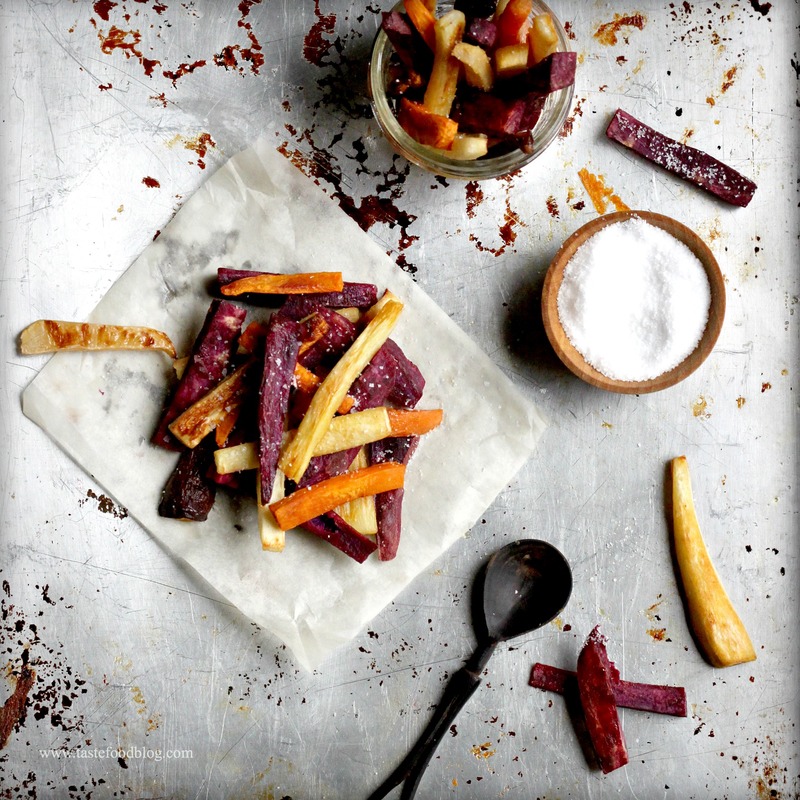 You can have your fries and still feel virtuous with these colorful roots. Give the russet potato a well-deserved break, and substitute carrots, parsnips, rutabaga, or sweet potato for the ubiquitous spud. As their name implies, root veggies are the roots of growing plants, which means that they are storehouses of energy and nutrients. Not only that, they are jammed with pent up flavor and natural sugars, which translates to sweet, earthy, nuttiness on the plate. Mix and match your favorite roots and spice to your taste. Simple salt and pepper is always a winner, or spice them up with a zesty mixture of cumin, paprika, and cayenne. And yes, you can have your dipping sauce too without tipping the scales. Try a cool and creamy Greek yogurt sauce infused with garlic and chipotle for a smoky, low fat and highly addictive sauce. Alternatively, ditch the sauce and ramp up the garlic notes with a zesty lemon, garlic and parsley gremolata. Heat the oven to 425°F. Cut the root vegetables in 2-inch batons, about 3/8-inch thick. Place in a large bowl. Add the oil, salt and pepper and toss to coat. Spread in one layer on a large rimmed baking sheet. Bake on the lowest rack of the oven until browned on the bottom, 20 to 25 minutes. Move the baking sheet to the top rack of the oven and bake until golden brown on top, about 20 minutes. While the vegetables are roasting, whisk the chipotle sauce ingredients in a small bowl if using. Serve the fries with the sauce for dipping. Alternatively, remove fries from oven and toss with the gremolata ingredients. Gorgeous colors and surely delicious! I agree! The vibrant colors from the array of root vegetables are just what we crave on gray winter days! And the spicy Chipotle Sauce is irresistible! I have a big bag of carrots in the fridge – perfect for this. Those look beautiful! I love make fries out of zucchini and sweet potatoes, but it sounds amazing with carrots or parsnips! Yummy, especially the chipotle sauce, using yogurt instead of sour cream makes it a healthy choice. My goodness – looks fantastic! Love the colors and bet they taste simply amazing! I love this photo!! Really beautiful. I love baked sweet potato and carrot fries. Looks like I need to branch out! Sweet potato fries are my absolute FAVE, and these look even one step better! Sounds to me like a great way to use up some of those roots sitting in my crisper. Especially love the Chipotle dipping sauce. These are the best, I love your photographs!